For the twenty-ninth year, the United Nations is celebrating World Population Day in an effort to draw attention to the issues that affect global population growth, such as family planning, poverty, gender equality, and more. To mark this day of awareness, we have compiled a set of essential facts around the major trends and consequences of population growth both on a global level and within individual countries. 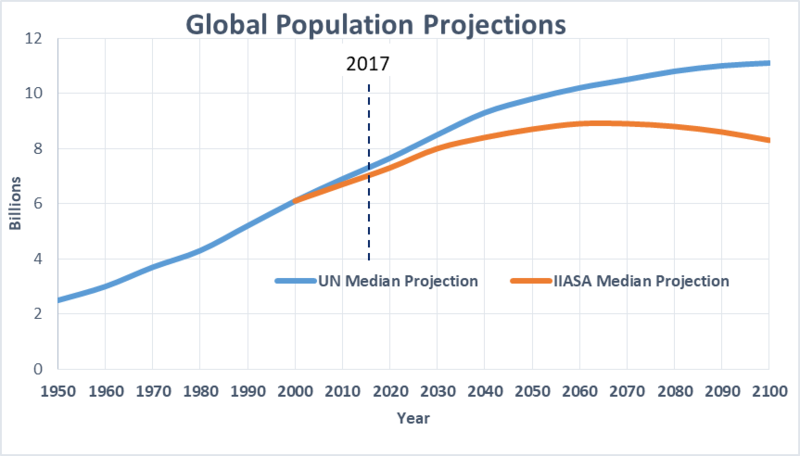 After tripling over the past 70 years, it appears likely that the world’s population of 7.6 billion will only see a modest increase over the next 80 years. This trend is projected to occur as a result of a population growth slowdown in Asia—the world’s fastest-growing region—as well as declines in Europe and stabilization in the Americas, creating a world where larger numbers of older people are less productive and will need constant care, which could dramatically disrupt our economic and social structures. At the end of 2016, there were about 3.2 billion people in the global middle class. 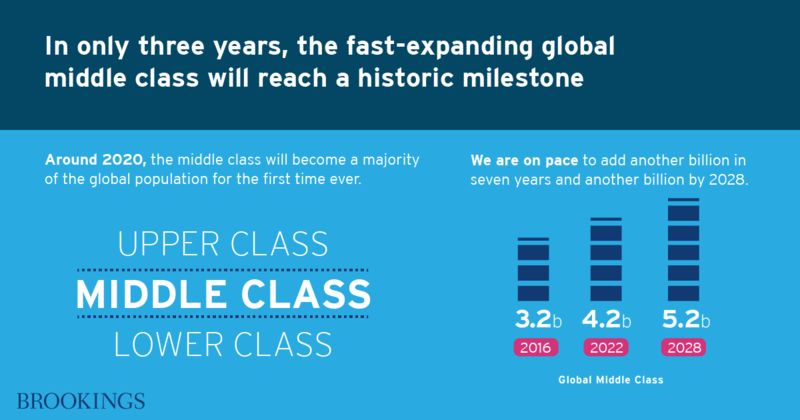 By 2020, the middle class will become a majority of the global population for the first time ever, and by 2028, the global middle class could number 5.2 billion people, with Asia representing the vast majority of new entrants. Homi Kharas, interim VP and director of the Global Economy and Development program at Brookings, argues this middle class explosion will have major implications for global economic markets and carbon emissions. While just 10 percent of China’s population—the world’s largest—is over the age of 65, that number is expected to rise to over 33 percent by 2050. Governance Studies VP and Director Darrell West and Ye Qi, director of the Brookings-Tsinghua Center, explain how this dramatic growth of China’s elderly population, in combination with other demographic and economic trends, will affect the country’s energy consumption and digital technology adoption. Despite active immigration, Russia has lost 3.7 million people since the beginning of the 1990s, the result of a deteriorating quality of life, rising male mortality, and a decline in the number of women of childbearing age. According to Sergey Aleksashenko, nonresident senior fellow in the Global Economy and Development program , Russia would need to encourage a large-scale immigration influx just to maintain its current population level, but even that would not be enough to offset the negative effects on the Russian economy. Already the largest country in the Arab and Mediterranean region, Egypt’s population is expected to grow from 104 million today to 128 million by 2030. Given the country’s high fertility rate, the government’s weak commitment to promoting family planning, and high national unemployment, the economic, security, and environmental effects of Egypt’s population boom are likely to be felt across the region and even the world. Between 2012 and 2015, nearly 40 percent of Japan’s cities and 33 percent of Western European cities experienced population decline. U.S. cities, too, are expected to experience slight declines in the coming years, though higher fertility and immigration rates in the U.S. promise to help make the country better able to cope with urban population loss. Population growth in the United States sunk below 0.7 percent in 2015-16, marking the lowest rate of growth since the Great Depression. This follows a larger pattern of U.S. population decline in the years since 2008, attributable mainly to recession-related delays in family formation among young adults and the long-term aging of Baby Boomers. 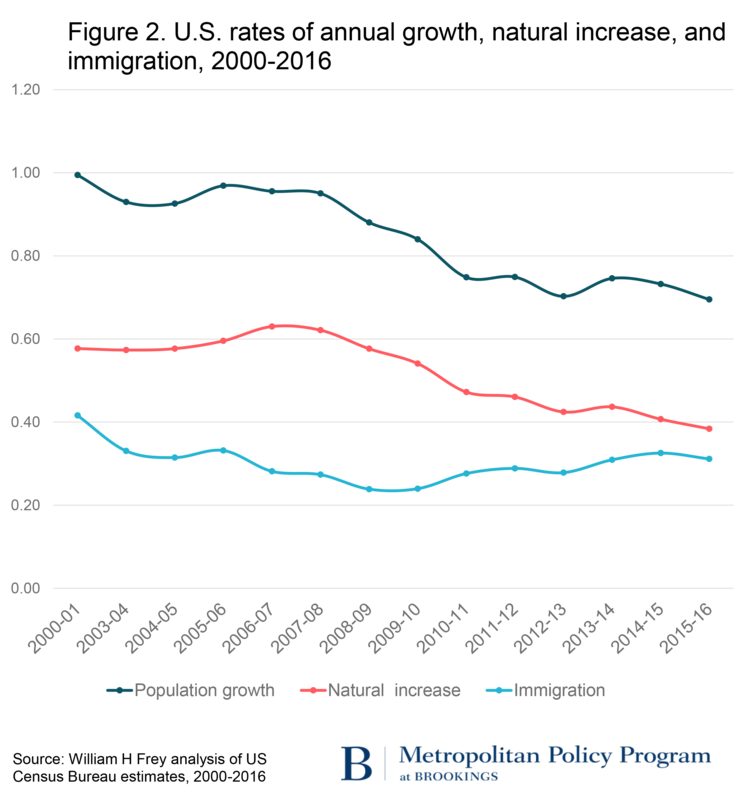 Still, writes Brookings demographer William H. Frey, overall population declines are being offset by increased immigration as well as population shifts to the Western Sun Belt, which could reverse years of slow economic growth. From 2010 to 2015, minority millennials in America contributed the lion’s share of population growth to both urban and suburban areas, while metropolitan areas like New York, Atlanta, and San Jose have seen the emergence of a “majority minority” millennial population. 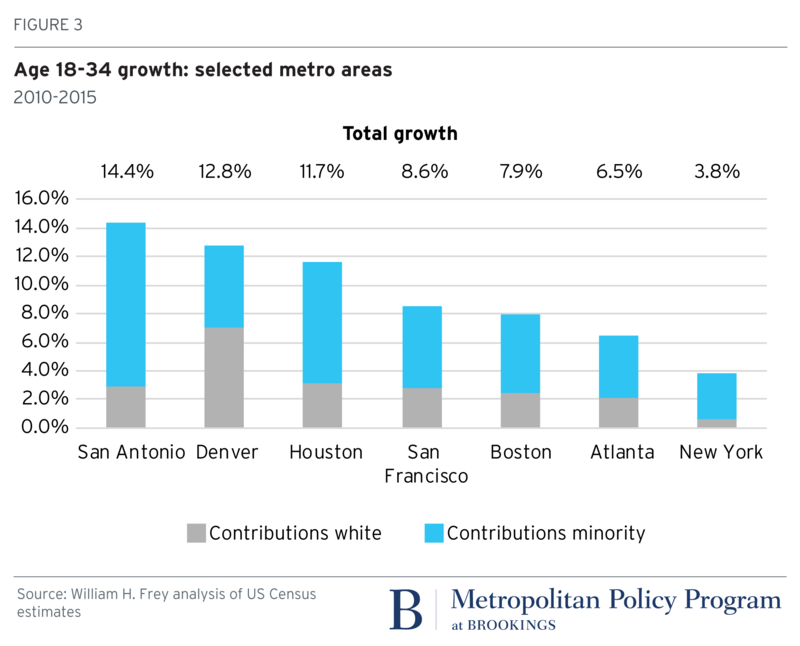 Given the propensity of young adults to gravitate toward cities, Frey predicts that America’s metropolitan areas will continue to grow more ethnically diverse in the coming years. 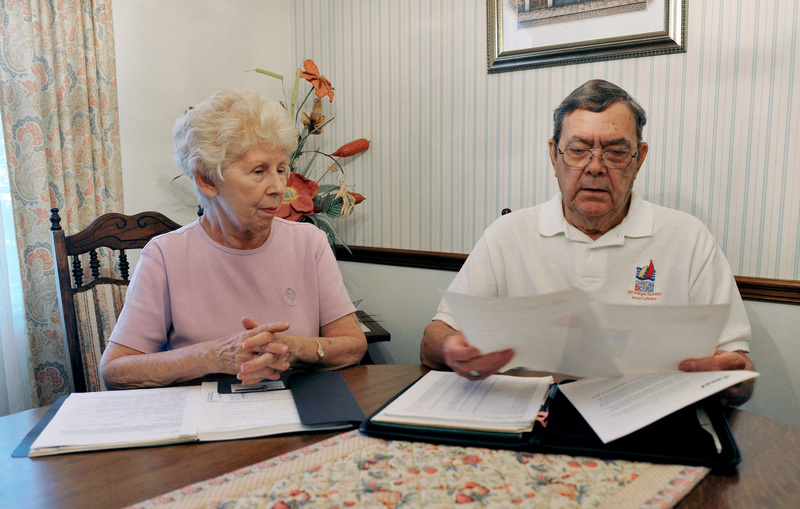 Americans aged 65 and older currently make up 15 percent of the economy, but in just 20 years, that figure will rise to 21 percent. But in addition to the aging of the Baby Boomers, Americans are living longer lives and having smaller families. This transition to a permanently older population, as Economic Studies Senior Fellow Louise Sheiner explains for the Brookings Cafeteria Podcast, is dramatically raising spending on Social Security and Medicare and contributing to the ballooning federal deficit. 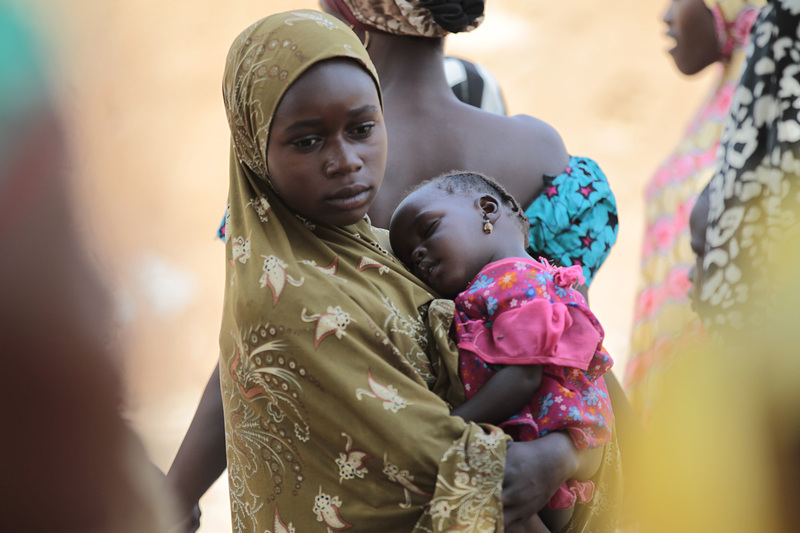 There is a strong link between higher levels of schooling and lower rates of fertility for women, as education empowers girls to undertake family planning and avoid the pitfalls of child marriage and early childbearing. Girls’ education is therefore an indirect investment in climate change mitigation by curbing population growth within the planet’s carrying capacity. In fact, as Christina Kwauk and Amanda Braga of the Brookings Center for Universal Education explain, investments in girls’ education and reproductive health could result in a reduction of 119.2 gigatons of atmospheric carbon! Vishal Narayanaswamy contributed to this post.